Despite more than half of the country’s population living in areas where recycling of unwanted electronics is the mandatory form of disposal, recycling rates of residential electronic scrap remain low. The last EPA estimates – from 2008 – guess the average American home has 26 electronic devices in use at any one time. That doesn’t count the millions of unwanted devices stored in kitchen drawers, basements, attics and garages. What are the greatest hindrances to increasing residential collection of e-scrap? Lack of access to recycling programs – or perceived lack of access – is a significant factor. 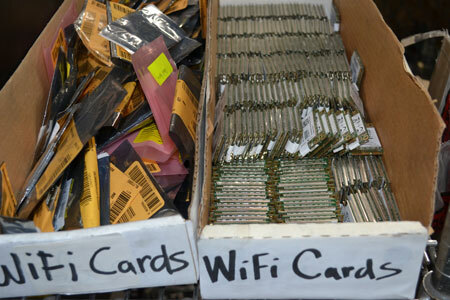 Barbara Jorgensen, Community Editor for EBN, a publication for the electronics industry supply chain, posted an article recently about her personal experience with trying to recycle electronics. She recounts the different rules the store has for recycling of different types of equipment, and notes some of them carry recycling fees. Her biography states she lives in the Boston area. In the article she notes that, rather than recycle her electronics right now, she’ll wait for the next free collection day she can make it to that is sponsored by her local government. That scenario is repeated across the country in states where consumer-friendly Extended Producer Responsibility laws for electronics are not in place. Such laws generally have some system set up so there is no cost to the consumer at the time of recycling for proper disposal of unwanted electronics. The article also shows a lingering sentiment in the American psyche that we should be paid for our unwanted electronics, like we’re paid for our recyclable metal and in some states, drink containers. People object to having to pay for having large electronics recycled – perhaps the thought is that these materials, after all, were much more expensive than beverages when they were purchased, and, therefore, should retain more value than water bottles or soda cans when its useful life is through. However, there’s a reason most electronics recycling companies are based in states where EPR laws – and the mandatory funding of recycling such laws entail – are on the books. Most electronics recyclers will tell you that it’s much easier to establish a new electronics recycling business in areas where governments have set up financial incentives to recycle e-scrap. Also, not all e-scrap commodities are created equal. 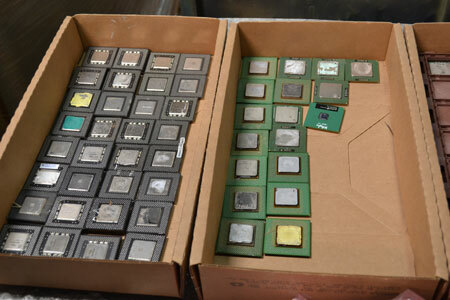 For example, to a recycler, there are much stronger markets for shredded circuit boards than there are for CRT television sets or computer monitors. Anecdotally, CRTs are the number one electronic product, by weight, collected at community recycling days. Massachusetts does not currently have EPR laws in place for electronics recycling. 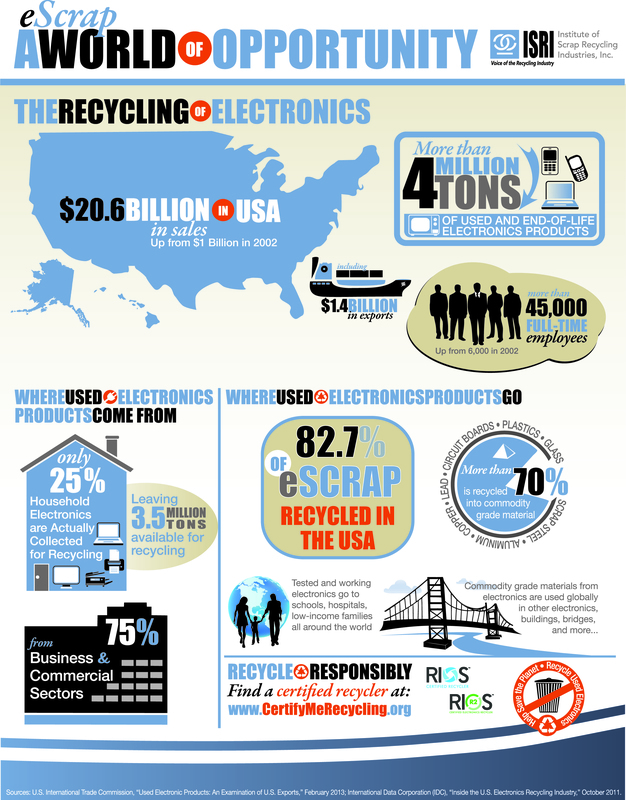 Perhaps, to help consumers over the perceived difficulty of electronics recycling, the state should join the 20+ states in the U.S. that have some form of electronic recycling mandate on the books. When public outcry and social awareness lead to the development of Fair Trade certification for coffee in the 1980s, Robin Ingenthron, formerly of the U.S. Peace Corps and founder of the WR3A (the World Reuse, Repair and Recycling Alliance), took note of the concept – allow a system of vetting and verification for consumers in rich countries to ensure that the premium they pay for certain services or goods are being produced or conducted in a safe, socially acceptable manner. When images of children growing up in the midst of unsafe electronics recycling operations began flooding the nation’s consciousness, Ingenthron saw an opportunity to expand the concept to areas outside agriculture. As a result, he is getting ready to launch Fair Trade Recycling, a company that ensures electronics exported to developing nations for reuse or recycling is handled properly. Images from one of Robin Ingenthron’s trading partners. For more information, visit WR3A.org. “If you put a blanket ban on anything, all you’ve done is drive the industry underground,” Ingenthron says. That would exacerbate problems of unsafe working conditions, labor practices and disregard for the environment, he says. Instead of assuming recyclers in developing nations will automatically ‘recycle’ electronics by burning plastics to get at precious metals in open fields while cooking for their families over the same fire, Ingenthron decided to see how recycling is really being carried out in places like Taiwan, China and Malaysia. What he found surprised him, and led him to create WR3A, an organization that uses market-driven solutions to address perceived problems within the electronics reuse and recycling field. “We have been impressed by self-educated technicians, struggling to provide internet, health, education and democracy through free market and trade,” according to his organization’s website. “Unlike stewardship programs based on “pledges”, “promises”, and “goals”, WR3A is based on civil law, or contracts. Our members believe that contracts and lawsuits are easier to enforce than international law. Our preference is to sign up companies already doing business under state or national contract, such as California, Massachusetts, or Maine, when the contract has environmental performance and reuse measures. When those companies violate the contract, we can call the state Attorney General’s Office,” according to the web site. Ingenthron is a supporter of the R2 standard for electronics whose facilities are certified in Vermont. The WR3A vets its contracting companies and that company’s downstream recyclers – companies that process materials an electronics recycler might not be able to handle in-house, like CRT glass or copper wire. “We wanted to make the process more transparent,” Ingenthron says. Fair Trade Recycling would mean companies looking for a market for reusable electronic products gathered in the U.S. would be able to look farther afield for end markets for their used displays, cell phones and laptops without having to fear for the safety of the environment or the workers handling the recycling and testing. What happens to your electronics when you drop them off for recycling? 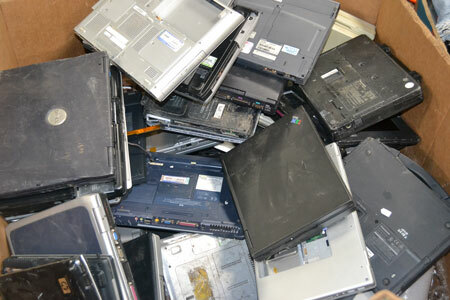 But what really happens when you drop off an old laptop for recycling? Let’s follow a hypothetical piece of e-scrap on its way to becoming new products. An old Sony laptop is brought into the annual Keep Fallbrook Clean and Green in Fallbrook, Ca. Sometimes, community organizations hold recycling drives - for aluminum cans or electronics - as a way to raise money. This annual event is like many community-sponsored electronics collection events – residents can bring their old computers and laptops, mobile devices and other electronics for recycling while doing other activities to beautify their properties and neighborhoods. 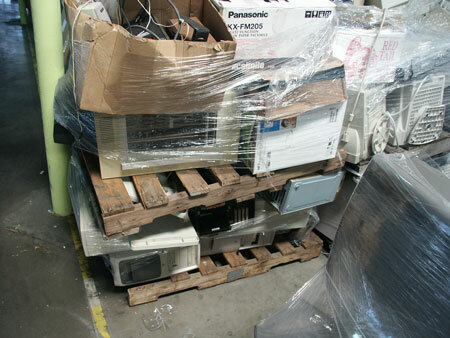 In California, items with display screens, like old CRT (old tube-style) and new flat-panels and laptops, among others, are prohibited from being sent to state landfills. Once a pallet or two of electronics have been collected, the organization sponsoring the collection notifies E-World Recyclers, a Vista, Ca. recycler. The laptop travels with other electronics turned in during the event to E-World’s recycling centers. Several hundred pounds can be collected at electronics recycling events. 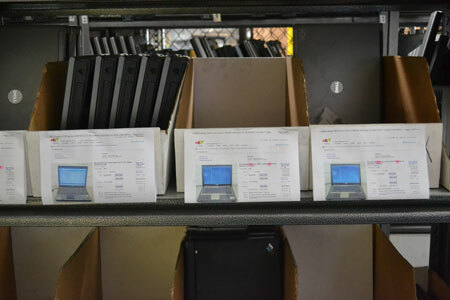 Once inside the recycling center, the laptop is inventoried, and a report generated indicating when the laptop was received, where it was collected and its brand and model number. Next it is tested – just because it’s been turned in for recycling doesn’t mean it is unusable. 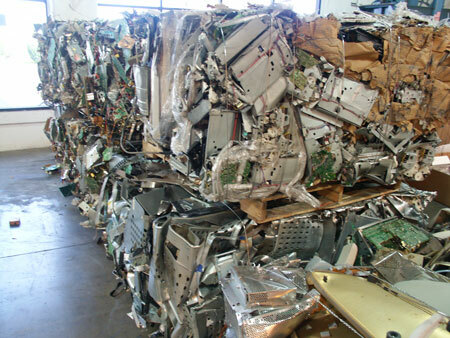 Reuse and refurbishment is a very important part of the electronics recycling industry. International Data Corporation estimates that about 30 percent of the 3.5 million tons of electronics collected in the U.S. for recycling in 2010 were reused in some fashion. The laptop is evaluated and tested to see if it can be resold as one unit. Reuse of electronics is an important part of recycling. If not, any usable parts are taken and resold – there is a strong market for quality second hand laptop parts, especially for parts like LCDs and CPUs. Now that the useable parts are stripped out of the laptop, further breakdown occurs. 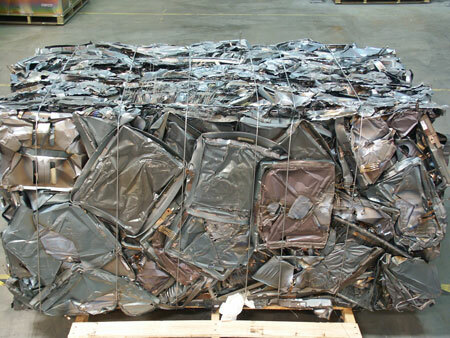 Steel from the body of the laptop is set aside to get recycled into new steel – The Steel Recycling Institute estimates that flat-rolled steel products contain about 30% recycled content while steel produced domestically for structural shapes have about 80% recycled content. Aluminum is also highly recyclable – and is an ever increasing part of the new electronics sold every year. Nearly half of the average aluminum beverage can (44 percent) is made from recycled aluminum, the Aluminum Association reports. Copper wires are bundled and sent to wire cutters and copper smelters. 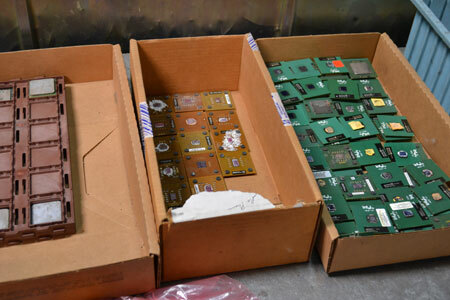 Circuit boards are set aside and sent to a special circuit board recycler and plastics head out to plastic recyclers where they’re made into any number of new products. Batteries are collected and sent to a company that specializes in battery recycling. Hard drives are sensitive parts of electronics. 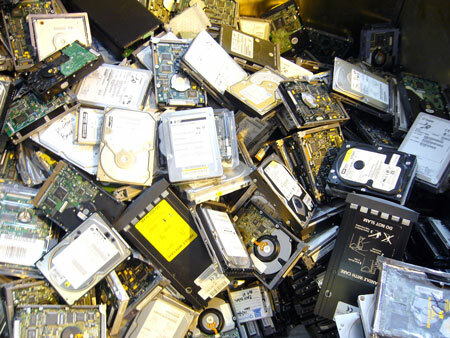 These drives can have all matter of personal and sensitive data on them – while they can be sanitized and resold, E-World Recyclers has decided to handle them in a different manner. The company catalogs each hard drive and secures it until it is destroyed. When it is time for destruction, the hard drives go into a shredder that was specially built to completely destroy hard drives. The shredded hard drives then go to a refining company for further recovery. 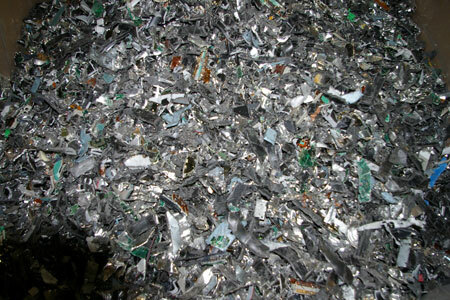 There, eddy current separators remove aluminum from the shredded harddrive mix; copper comes out of the stream through the use of reverse polarity magnets, while traditional magnets pick out any steel left over. 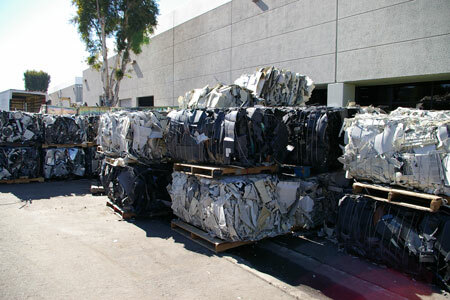 Plastics are removed through shaking systems, and platinum and other precious metals are recovered as well. Hard drives are inventoried and kept secure until destruction. Shredding hard drives destroys any data contained in the device and makes it safe for recycling. In the end, the Sony laptop dropped off in September is now heading out as unique, specification grade commodities (steel, aluminum, and copper) into the manufacturing stream, where the commodities it was made from can become new steel, aluminum and copper products.